UPDATE (2013-06-06): This solution is now also available for SharePoint 2013. Download it here. The 2010 version is still available for download. In SharePoint 2010 the user experience of uploading & inserting images into publishing pages has been greatly improved. Uploading and displaying images in list items however is still the same as 2007, which is pretty bad. You can hack this by adding an existing site column of type Publishing Image to the list. The user experience however is still pretty clunky. In this post I will provide a walkthrough of developing a custom field type that will provide an intuitive user experience for uploading and display images in list items. The rest of this post will be a walkthrough for creating this custom field type. 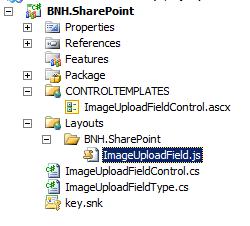 Here we are returning an instance of ImageUploadFieldControl to be used as the field rendering control. We will create the ImageUploadFieldControl class in the next step. 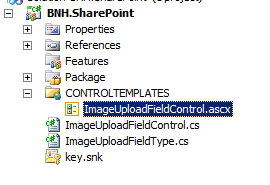 Add a public class call ImageUploadFieldControl to the project and make it inherits from BaseFieldControl. This will require you to add a reference to System.Web.dll to your project – go ahead and do that. Here we are specifying that a rendering template name ImageUploadFieldDisplay should be used when the field is in display mode. Otherwise, a template name ImageUploadField should be used. We will create these 2 templates next. As you can see we have declared 2 rendering templates. As specified in our field rendering control class, the 1st template will be used when the field is in new/edit mode. The 2nd will be used for display mode. These templates are empty at the moment. We will now add controls to them. btnRemoveImage: a button to allow the user to remove the image. //Now instantiate the control instance variables with the controls defined in the rendering templates. //is why we are hiding by CSS. /// Tweaks controls depending on whether a value has been specified for the field. Since we are inheriting from SPFieldUrl, the type of our field value will always be SPFieldUrlValue. //the editing template. Our field is based on the URL field so we will need to deal with SPFieldUrlValue. //in our field type class. Return an empty UrlValue instead. Add the following code for the launchUploadImagePage() function to the newly added JS file. This function is called by our edit rendering template. extract the new URL and save it to the SharePoint field on postBack. imageControlID:	the HTML ID of the IMG element that is used to display the uploaded image. urlHolderControlID:	the HTML ID of the INPUT (hidden) element that will hold the URL of the uploaded image. Browse for an image to upload and display below. The above code is pretty straightforward. We added an ASP.NET FileUpload control (fileUpload), a button (btnUpload) to allow the user to initiate the upload process, and a button (btnCancel) to cancel. /// Closes the dialog and returns the OK result to the client script caller. /// Closes the dialog and returns the specified result to the client script caller. /// Closes the dialog and returns the specified result and returnValue to the client script caller. //TODO: Handle case where the IDs are not specified. //a value specified. Unhide them here. The above code is fairly straightforward, but review the in-code comments for further explanation. FieldEditorUserControl: Our field type will have custom properties. This user control will be displayed and used to edit the custom properties when we create/edit columns of our field type. We will create the referenced user control in a later step. PropertySchema: This defines the custom properties associated with our field type. While MSDN states that PropertySchema has been deprecated, I have found that it is required for the value of custom properties to be saved. Another thing to note is that we have set the Hidden property of our custom UploadImagesTo property to be TRUE. This is because we want to use our user control as the UI for editing the custom properties. The Hidden property is actually not documented but it works. Most of the above code is styling to get the SharePoint look and feel. The control of interest is txtUploadImagesTo, which is a text box that will allow the user to configure where the field should upload the images to. //which case the default value (as specified in the fldtypes XML will apply). /*This is perhaps the most tricky part in implementing custom field type properties. * The field param passed in to this method is a different object instance to the actual field being edited. The code-behind class needs to implement the IFieldEditor interface. We need to use the LocalThreadStorage to save the values of custom properties (review the link in the comment). We also need to do additional work in the main field type class in the next step to make this works. Remember that we still need PropertySchema defined in the fldtypes XML for the field type, even though MSDN states that PropertySchema has been deprecated. In the last step our field editor user control puts our custom property value into the LocalThreadStorage. We now need to edit our main field type class (ImageUploadFieldType.cs) to intercept the Update event to pull the custom property value out of the LocalThreadStorage and save it with the field. We also need to intercept the OnAdded event and force an update to save our custom property value when the field is being created. One thing to be mindful of in the above code is that the type of value will be SPFieldUrlValue as our field is inherited from SPFieldUrl. The key bit in the above is “FieldRef[@FieldType=’ImageUpload’]”. This ensures that this XSL is only applied to instances of our field type. That’s it! Go ahead and deploy your solution. You will need to do an IISRESET after deploying for SharePoint to pick up the new field though. The code as originally posted here does not allow you to programatically set the UploadImagesTo property of the field. I have refactored the code a bit and expose UploadImagesTo as a public property. You can download the new code here, which also contains a test harness demonstrating how to programatically create the field and set the UploadImagesTo property. Below is an example of the XML you can use to provision a site column of this field type from a feature. Ensure that the field type is already deployed before installing/activating this feature. many thanks. with your solution, now i’m solved my problem with upload image. Great post, demystifying many of Sharepoint’s capabilities! Do you think what I am trying to do has a great degree of difficulty? Hey Aris, You would be better of inheriting from SPFieldText and store a delimited string as the value for the field (e.g. url1;url2;url3). SPFieldCollection is a collection of fields (and is not a field type). With what you are trying to do, you will still have just 1 field, but that field will hold multiple values. All the hooks required to make it works will still be the same – so it should be possible. You may run into some challenges in getting the view XSL to work. Then again, I’m probably just saying that because I’m not very good at XSL :D. Good luck. I have the same requirement. Were you successful in modifying the code to support multiple files? If so, would you be willing to share? Great Post. How long did it take you to figure this out and how much hair did you rip out of your head in the process? Allot of work just to create a reusable UI Widget. I guess it is a bit more then just a UI component since you have multiple views and are providing data storage. Hey John, the coding took a couple of weeks (on and off). Writing up the post took another couple of weeks :D. It was quite satisfying at the end however to have produced something that is reusable, stable, and potentially useful to others. Great article but it didn’t have evertiyhng-I didn’t find the kitchen sink! Thanks a lot for your efforts, it’s a great article. Fantastic article. This is exactly what I’m looking for. Its not working with document libraries, what should i do to make it working with document library. What error/issue are you getting when using the column in a document library? That message is expected. You also get that message if you select the OOTB Managed Metadata column type. “Client programs” here means other programs that interface with SharePoint, e.g. Office applications. When you use MS Word to edit a document in SharePoint for example, the columns of the document library will be displayed in Word, and you can edit those columns straight in Word. If the type of your column is unknown to Word, then you will not be able to edit that column in Word. And if you made this column mandatory, then you might not be able to save the document from Word into SharePoint. Test it out, but I don’t think it will be a major problem for you. In the worst case, the user will have to save the document in Word, then go back to SharePoint to specify a value for this column. Why is the path being duplicated? Hey Chad, by custom list style, are you referring to the vwstyles.xml? Or a custom XSL you have applied to the list? I have not worked much with either of these, but if you can post the source of your custom list style perhaps I can spot something? Thank you! Below is my custom ItemStyle.xsl. The @PhotoURL is pointing to the custom image upload column. Do you know how can i create a field of this FieldType and add it to a SPList programmatically? Hi Gustavo, download the new code in section 14. Updates above. This now has a test harness demonstrating how to create the field programatically. Its great! Its work perfectly. Now i have another cuestion. Do you think that i can made like a picturegallery in a field, i mean having a field that i can upload a lot of pictures and when its shown in a list show all of them like a picture gallery (the webpart)? Its possible to do that? Hi Gustavo, the code I have here doesn’t do that, but yes – you can certainly update the code to do what you describe. It should be fun :). Bernardo, i’m new in Sharepoint. Can you tell me briefly which files should i modify to made like a picturegallery in a field, i mean having a field that i can upload a lot of pictures and when its shown in a list show all of them like a picture gallery (the webpart)? Do you think its very dificult to do this? Anything you can tell me its great to me! You first need to update the ImageUploadFieldType class to be able to hold multiple URLs. 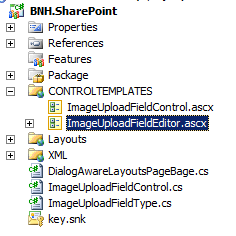 You will then need to update the 2 rendering templates in the ImageUploadFieldControl.ascx file – this will depend on the user experience you want to give when viewing/editing the field in the UI. Next you’d probably want to update the UploadImage.aspx file to enable users to upload multiple images without leaving the page. 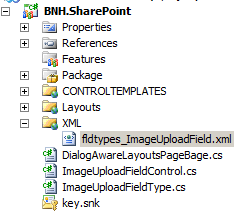 Lastly you will need to update the fldtypes_ImageUploadField.xsl to display the images in list view. Overall I think the difficulty level would be medium, but it’d be a lot of work. I’m not sure of the business requirements you are trying to cater for, but perhaps you could take a different approach all together. Rather than using a custom field type, you could use a normal Hyperlink field. You could then create a different picture library for each item, or a different folder within the same picture library. The hyperlink field then would contain the URL to the specific picture library or folder for that item? The user then can click on the link to go to the library/folder and upload images to there? Bernardo, exists a way to change the size (height and width) of the image field?. If i select a image too big it shows in the real size, and i want a custom and fixed size for the field. You can add width/height attributes to the img tag in the XSL to control the size of the image in list views. Add width/height attributes to the asp:image tag in the 2 rendering templates to control the size in edit/display forms. If you want to make the size configurable, then follow the same pattern as UploadImagesTo to add 2 custom properties for the field type. Good luck. How can i set UploadImagesTo programmatically? Hi Dan, the code originally posted does not allow you to do this. I now have refactored the code to make this possible. Download the new code in section 14. Updates above and check the test harness that demonstrates this. example ,i created column called degree , i want to display the value of degree column in List view with green color if column value >15 and with brown color if column value < 15 . can you please help me in this point ?? i want to do this in the solution by development , i mean i need to do this feature without designer . can u help me ? Thanks for the article. I am having trouble implementing this though. When I try to add a new item I get an exception in the SetupEditTemplateControls() method of the ImageUploadFieldControl class. lnkLaunchUploadImagePage.HRef, imgImage.ClientID, and hiddenImageUrl.ClientID are all null. Where/how are they set? lnkLaunchUploadImagePage.HRef is set in the RenderingTemplate for edit mode (in ImageUploadFieldControl.ascx). The value of the ClientID property is auto-generated by ASP.NET. Check that the following objects are not null: lnkLaunchUploadImagePage, imgImage, hiddenImageUrl, base.List and base.Field. Did you find a solution to this? I’m running into the same error. Having trouble finding where those objects are set. In the C# code, the lnkLaunchUploadImagePage, imgImage, hiddenImageUrl instance variables are defined in the ImageUploadFieldControl class. Within this class, these variables are set by the InstantiateMemberControls() method. Within this method, these variables are set by calling TemplateContainer.FindControl(“[controlName]”). [controlName] is the name of the corresponding control as found in the ASCX that defines these control – and this is ImageUploadFieldControl.ascx. The FindControl(“[controlName]”) call will return null if the control is not found. Therefore, double check that the control name matches with the ASCX. Thanks for the great article. This add on is great. I found my issue. I had created the ImageUploadFieldControl.ascx file in a sub folder by mistake. Because of this the controls were never being created. Moving the file out of the sub folder to the Control Templates folder did the trick. Glad you found the problem and thanks for posting back with the fix :). can u help in uploading document instead of images to library. Hi Manjula, you should be able to adapt the code to achieve that. Most of the changes will be in the rendering templates. Good luck :). As the custom field inherits from the SPFieldUrl type, you can work with its value exactly the same way you’d with the OOTB SPFieldUrl. Congratiulations ! This is one of the best tutorials I ever seen . Thanks a lot ! It sounds like the list does not know how to render the new field type. Did you apply the XSLT in the last step correctly? Also, if you just download and deploy the solution, remember to do an IISRESET after deploying the solution. This blog post was EXTREMELY helpful and considering its complexity, very easy to follow. Thank you! i have atrouble after i upload the image on clicking save it display error that field is required can u help ?? Did you modify the code? And what is the exact error message? Hi, many thanks for this. It helps me a lot! But got one problem… when I deploy the solution in my dev environment it works very well but when I deploy it on the test environment, everythings is fine except that the xsl doesn’t seems to apply. XSL is deployed to 14/template/xsl but the image doesn’t want to show up. Have I miss a settings on the server ? Why is the xsl not applying on test server but on dev server ? Did you do an IISRESET after deploying the solution to TEST? Is it a multi-servers farm in TEST? (and DEV?) Did you deploy the solution as is – or did you make some code changes? Yes, iisreset is done. It is not a server farm, it’s two totaly separate servers. And no change made to the solution. I’m trying to modify directly fldtypes.xsl to see if I can find something. If I modify this template : it doens’t do anything (even after iisreset). OK, so your TEST environment is a single-server farm. The solution deploys a separate XSL file, namely fldtypes_ImageUploadField.xsl. Do you see this file on the TEST server? Also, have you applied any special permissions to the library where the images are uploaded to? Well, I just find the solution. Don’t know why but this template “” was modified in the fldtypes.xsl. This template wasn’t calling the URL_BODY mode. I fix this and now it’s OK. Thx for your help ! Great! Glad to hear :). I had to make one change on here to support external users. In protected void EndOperation(ModalDialogResult result, string returnValue) I had to remove Page.Response.End(); due to a generic “System.Threading.ThreadAbortException Thread was being aborted” error. Removed it and all is well! Thanks again! Glad to hear you fixed the problem, and thanks for posting back the fix :). Hi Bernardo and thanks for sharing this. 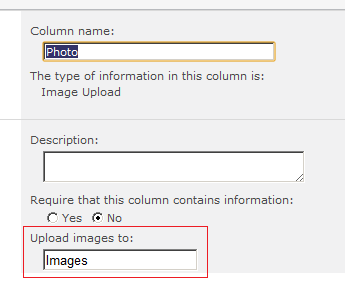 I’m able to select the Image upload field when creating new list column, but when i want to ad item, after selecting the image and pressing upload, i get generic error : Server Error in ‘/’ Application. I’ve checked and there is no folder Images in TEMPLATE\LAYOUTS so i created it and created blank.gif, but it wasnt the reason for thing to not work. Do you by any chance have any clue or a tip where to look for a problem? Hi Orshee, the generic error you are getting is not the real error. customError is enabled by default in SharePoint, and looks like it is still enabled – and therefore you are not seeing the real error message. 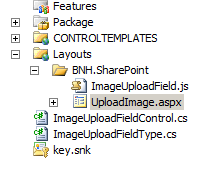 The original code uploads images to an Images library in SharePoint, not to an Images folder under the TEMPLATE\LAYOUTS folder. If you haven’t created the Images library in SharePoint, that may be the reason for the error. If you have already created this library, then you’ll need to disable customError so we can see the real error message and troubleshoot. I’ve realized i need to create library after looking at code and so i did. I alsto tried to find why i’m getting generic error even tho web config clearly says its in debug mode with no custom error pages. Additionaly after creating library for images, i’m no longer able to succesfully add column to the list, i do get the option tho choose the Image upload column, but after setting the name and pressing ok, i again get same generic error. I tried removing library again, retracting and redeploying solution, restaring iis, but i cant get past this steo any more. Once again thanks for the time and effort as this indeed is great example, and i hope we can find out whats wrong in my case. It is strange that you are still getting the generic error message – this is not going to be helpful. If you are getting an error when trying to create the column using the SharePoint UI, then it looks like the problem is in the field type definition – as no custom code is executed at this point. Check that the field type definition XML is there under SharePointRoot, and check that the assembly is in the GAC. In any case, getting the real error message to show would really help. Great tutorial, thx! I’m working on also an a custom spfieldurl type and so your walkthrough was very helpful. But i think we both have the same problem: the description is not rendering in list view. I tried it with your solution and when you look at the source of the site after loading the listview, the description / alt-tag is empty….. any idea? Thx for help! Great to hear you have found the solution! – and thanks for posting back the fix! Sorry I did not consider InfoPath for this solution. Good luck. For some reasons, I’m in need of exactly the same feature in MOSS 2007. So, i did try to ape your code. After successful deployment, when i select the newly created “Custom Field Type” i hit the error, “File not found”. Could you please show some light. Hi Sriniwas – I don’t have access to a 2007 environment so can’t reproduce and investigate this. When you get the File not found error try right clicking on the page and select View Source. Sometime you may find the missing file identified as comment in the page source. Hi Beranado – I couldn’t find any in the “View Source”. Thanks for your reply though. Great solution! Thanks for sharing. One question, I would like to save images as attachments rather than into a document library. How can i approach this? That is going to be a bit tricky. You probably still need to upload the image first to a temporary document library so you can show it in the list item form when a new list item is being created. You will then need to see if the SPField class (the top parent class of our custom field type class) raises any event when the item has been updated/created. If so, you will need to handle this event and create the attachment for the list item and delete the image in the temporary document library. If there’s no such event, you may need to implement an event receiver on the list, and create the attachment on the ItemAdded/Updated event. This however would make the field type clunky and not very reusable. You also need to make sure that you can reference the image after it has been attached to the list item by a URL. This is so that you can set the field value to this URL, and display the image in list item form and list view. Got the code deployed and all but still got an error about somewhere is receiving a null exception, maybe I had rush into it too fast. Will be looking into it and drop a reply here as to why. Regarding the null error, check that you did NOT create the user control under a sub-folder. Please see Erik D’s comments against this post on February 5 and February 6. Hopefully that will help. Regarding programmatically setting up the list – yes you should be able to. Make sure you download the updated version of the code. There is a Harness project in the solution with sample code that does just that. Thanks for the reply, I did up everything again and this time, it finally works! But I’m unsure as to why. With regards to setting up the list programmatically, is the only thing that is required to add on to this code that you have blogged above (not the available for download one) is to expose the “UploadImagesTo” to the public? 2) Resize the images to fit the required file size or dimension — this way, I wouldn’t have to pause the user’s upload. What would you advise for this part? Would it be idea to fit in any Event Handler into the code (that you had written above)? Glad that it works for you now. Regarding setting up the list programmatically, making the UploadImagesTo property public was one of the changes, there were other minor refactoring – which may or may not be required for it to work. It has been quite a while so I don’t remember exactly sorry. Both versions of the code are available for download. Regarding intervening the uploading process: for what you are trying to achieve, I’d put the code to automatically resize the image in the btnUpload_Click() handler of the ASPX dialog page (in step 5 of the post). This is where you are taking the image from the user’s machine and adding it to the library. It makes sense to add any image pre-processing logic here. It would be simpler to automatically resize the image, rather than prompting/warning the user. This would help to eliminate one interaction step. Should I write a SchemaXML and create or update the field? (Where in the SchemaXML, I’ll write the “UploadImageTo” within.) If so, how do I write it? If not, is there any files I should write up within my separate solution? The second one is — How do I detect that this custom column type is already deployed? Is the problem being you can’t reference the class ImageUploadFieldType from your 2nd VS solution? If so, you should be able to just add a reference to the DLL of the 1st VS solution to the 2nd solution. When you do this, the 2nd VS solution will not automatically include this DLL in the WSP by default. I have also updated the post with section 15 to show the XML that you can use to provision a field of this type from a feature. This XML contains the setting for the UploadImagesTo property of the new field. If you want to use SchemaXML to create/modify the field, the XML should be the same as this. Regarding checking if the field type is already deployed, I’d suggest checking if the solution containing the field type is deployed. You can access the collection of solutions for the farm using SPFarm.Solutions. But the ‘UploadImagesTo’ doesn’t gets updated with the value ‘My Image Library’ when the list gets created programmatically. Any idea how to fix this update? With regards to the 2 issues I found in both of my last reply, I haveI found the solution to updating the ‘UploadImagesTo’ already. I totally forgot about SetCustomProperty() method is available under SPField. NOTE: This piece of code was written in another Visual Studio solution where I was writing another webpart which uses custom image upload as I programmatically create my list. Thanks for posting back with the solution :). As per my last comment, consider adding a reference to the DLL of the field type to your project so you can avoid referring to the property by string. The dialog title is specified in step 5 where you create the ASPX dialog page. It is in the markup of the ASPX page as below. Very helpful job, thanks to share that !!!. I need the same requirment for SharePoint 2013. I will try the code as soon as possible. Did u already try it into 2013 ? Hi Vannick, I haven’t had a chance to try this on 2013. Would love to hear how you go with it! Ok i will give some updates about that ! Hi Vannick, apology for the late reply. SharePoint 2013 adds ’15’ to the _layouts and _controltemplates virtual paths. Try adding ’15’ to the path where the control ImageUploadFieldEditor.ascx is being referenced in the code. Vannick, I have gone ahead and convert this to SharePoint 2013. You can download the new code at the top of this post. Let me know if you run into any issues. Want to know . how to upload multiple docs for same product under different columns. Upload here means need to upload document (MS Word/PDF/Excel). You will need to adapt the code to work with documents. Most of the plumbing will be the same. The upload dialog and the list view XSLT will need to change. Then you can create multiple columns of this type in the list. Wow this solution looks exactly like what we were looking for. As a non-developer, could you explain how I could deploy this solution to SharePoint 2013? I downloaded the VS project, but was expecting to see the .wsp file in the bin Release folder? I’m also unclear whether this would be a site solution or a farm solution? Any help you could provide would be greatly appreciated. Thanks! The uploaded solution is uncompiled code so you’d need to open and compile it in Visual Studio. I’m guessing you don’t have access to VS as you are not a developer. I have compiled the WSP for you. You can download it here: https://app.box.com/s/3lg1i5hj1umry2ymbvjg. You are an absolute star! How can I donate some money for you!?? Such a massive piece of work completely for free? Unbelievable! Thanks and appreciated for the kind thought Lukas :). I’m just happy to be able to share something that others might find useful :). I tested your solution in development and it worked well. (After deployment it is not listed under Site Collection features which is quite confusing. You just create a column and your solution is one of the options in the column list). When I wanted to do it in production (exact same replica of dev), the solution deployed successfully, but the column option is not available in ‘Create New Site Column’. What might cause this? There is no features to activate or deactivate so it doesn’t show up in the Site Collection features page. Regarding the issue in PROD, did you perform an IISRESET on the server after deploying the solution? Is your PROD a multi-server farm? The XML that defines the custom field type is cached by IIS, so it is worthwhile trying an IISRESET. IISRESET resolved the problem. Thank you! Hi! Thanks for this awesome Solution! But then I have a question, how could I input details/metadata of the uploaded picture while uploading it? That would require some work but should be achievable. One approach would be to extend the UploadImage.aspx layout page to include this functionality. Hello, thank you for your code, that work fine, but I have one question, can I use the new created image upload fiels with search ? I cannot find any crawled property in my shearch schema, the goal is to get the value to display the image in search result. is that possible ? I have not tested this solution against search. However, since the underlying type is based on the OOTB HyperLink field type, it should work with search as OOTB fields do. Regarding the missing crawled property, make sure that you have created at least one list item with this field populated, and then kick off a full crawl. The crawled property is only created if there is at least one list item with a value in this field. Hello, It’s now working, I have found the property and been able to use this solution to create a contact list. Search is working too, I can retrieve the hyper link to the picture and display the image using search and display template. Thank you for your reply and your job. That’s good to hear – and thanks for reporting back that it works with search :). I have to admit I did not test this with the content query web part. Seeing that the field type is essentially an OOTB HyperLink field underneath however, it should work as OOTB fields do. Are you using one of the OOTB item styles in the web part? Perhaps you could test adding an OOTB HyperLink field to the library and configure your item style to look up that field instead? This would help determine whether the problem is with the field type, or with the item style you are using in the web part. Thank you, Bernado for prompt reply. Yes, I am using OOTB Item style. As advice, OOTB HyperLink field is added. Manual added the URL for each entry. Look up to that field is working. Bernado, thank you for the solution! Could you to recommend some books to learn SharePoint? Hi Bernado, thanks for the solution. I deployed the Sharepoint 2013 version…it works fine, except for one issue. I have a Lookup (information already on this site) field type on the list…which looses its values when I click on the “Remove Image” link (does a postback). Is there a way I can fix this? Thanks. ” property of the ListFormWebPart to “Server Render (ServerRender)”…this help retain the Lookup control’s data after postback. Thanks for your help. That makes sense! Thanks for posting back the solution :)! Can you give me sample code? Do you have any soluation? I am planning to use it with sharepoint 2010. I have not implemented it yet. Can i use this field with infopah 2010? Can i add file extenstion restrictions? This won’t work with InfoPath form unfortunately. I will try to use it with sharepoint forms. The code doesn’t restrict the file types that can be uploaded. I imagine this wouldn’t be a complex enhancement though. I was headed towards writing a custom field type and i came across this – you saved me a ton of time – it was also great that is just worked – rarely does this happen. Hmm that’s a good question! I have never tested this against the REST API. I will need to look into this. I’m afraid it won’t be soon though as I don’t have much capacity at the moment :(..
Do you have any possibility to upload a compiled version (wsp) also for SharePoint 2013? How to change the exexcute location from 14 to 16 ?